Have you ever wondered how your body stays at a consistent temperature or knows how much energy it needs from the food that you eat? It’s all thanks to a small butterfly-shaped gland located below your Adam’s apple called the thyroid. It produces special hormones that regulate your metabolism, or the pace at which certain processes occur in the body, and other functions such as body temperature, breathing and heart rate. With a role as vital as this, it’s important to learn about your thyroid and perform regular checks to recognize disease early on, especially in older patients as they require careful treatment. The thyroid has two lobes on each side, and at its normal size, you can’t see or feel it. It collects iodine from your blood stream to produce two hormones called T4 (thyroxine) and T3 (triiodothyronine). These hormones control how your body uses its energy. When your body needs these hormones, they travel through your blood stream to the cells that need them and attach to special receptors in the cells’ nuclei. It is important that T4 and T3 levels are not too high or too low in order to maintain a healthy balance. A healthy thyroid produces the exact amount of hormones your body needs to run properly. However, disease, certain medications or damage to the thyroid can impede the thyroid from producing the right amount of hormones, causing your system to slow down (hypothyroidism) or speed up (hyperthyroidism). These two conditions are usually symptoms of other thyroid diseases, which are fairly common. According to the American College of Endocrinology, as many as 30 million Americans are affected by thyroid disease, and more than half of those remain undiagnosed. People who have a family history of thyroid disease, are over the age of 60 and women are at higher risk of developing thyroid disease, according to the National Institutes of Health. When your thyroid doesn’t produce enough hormones, you may feel tired, weak or depressed. It may cause you to not tolerate cold temperatures, have memory problems or dry skin. There are several causes for hypothyroidism, but the most common are surgical removal of the thyroid, radiation treatment and autoimmune diseases. Certain prescription drugs may also impede the thyroid from making enough hormones, but this is most likely to occur in patients who are already genetically predisposed. Because of the broad nature of symptoms for hypothyroidism, it is difficult to diagnose without blood tests. Once a diagnosis has been made, it is treated by replacing the correct amount of thyroid hormone that is missing in order to bring it back to normal levels and restore balance in your system. This is usually a life-long treatment plan as hypothyroidism cannot be cured, although there are some exceptions, including patients with viral infections or if it was caused by pregnancy. On the other hand, when your thyroid starts making too many hormones, your whole system speeds up. Symptoms include nervousness, anxiety, increased heart rate and difficulty sleeping. You may experience muscle weakness, thinning of your skin and brittle hair. You may also notice you’re losing weight despite eating well, and women may experience lighter and less frequent menstrual cycles. The most common cause of hyperthyroidism is Grave’s disease, in which your immune system attacks the thyroid, causing it to produce too many hormones. Grave’s disease is usually genetic and occurs most commonly in young women. Diagnosis for hyperthyroidism involves your physician checking for an enlarged thyroid and a rapid heart rate. A blood test will confirm the diagnosis by checking your thyroid hormone levels. Treatment options include taking beta-blockers, antithyroid drugs, radioactive iodine or surgical removal of all or part of the thyroid. These treatment plans vary from patient to patient, depending on the type and severity of hyperthyroidism, other medical conditions, personal preference and age. Age is a key factor in treatment for both hypothyroidism and hyperthyroidism. Older patients require treatment to be closely monitored due to the effect of fluctuating thyroid hormone levels on the heart in those with hyperthyroidism and an increased risk of bone fracture in those diagnosed with hypothyroidism. 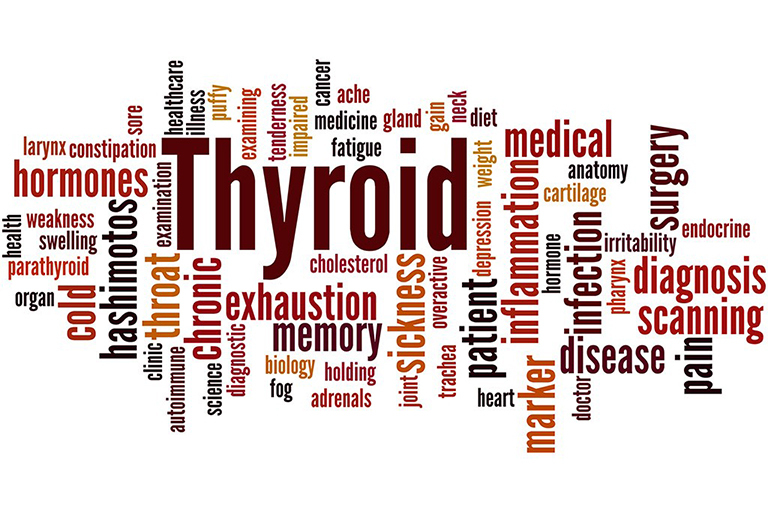 The American Thyroid Association recommends close monitoring of all hypothyroidism patients treated with thyroid hormone replacement due to many patients being overtreated or undertreated. This problem is very important in older patients as excess thyroid hormones could lead to bone loss, according to a study by MRC Clinical Sciences Center. Although thyroid diseases are not preventable, you can take measures to catch signs of a disease early on so it can be treated promptly. The American Association of Clinical Endocrinologists suggests people who are at risk to perform regular Neck Checks™ with a glass of water and a handheld mirror. Simply hold the mirror so you can focus on the lower front of your neck and above your collarbones (don’t confuse your thyroid with your Adam’s apple). Tip your head back and drink some water. As you swallow, watch for any bulges or protrusions. If you see any, contact your physician to determine whether further evaluation is needed. If you have a family history of thyroid disease, you may benefit from routine screenings to test your thyroid hormone levels.